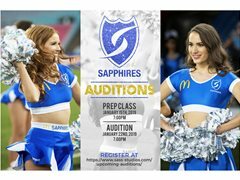 Want to be part of the Sapphires?! The official cheer squad for the NRL Canterbury-Bankstown Bulldogs. We are looking for talented dancers, gymnastics, and cheerleaders over the age of 18. Please apply to register today. All information will be sent to you via email on receiving your registration. Interview: Auditionees will be required to undergo a short interview with the audition panel. Choreography taught - Auditionees will be taught 1-2 choreography blocks and be required to perform this within small groups. Stunt Team and Tricks - As well as dancers we are giving stunt cheerleaders a chance to audition and show us what you've got! It's recommended you audition as a stunt team of 4-5 and we will have its own section of the audition for you to showcase your group. We would still like stunt teams to join in the choreography of the audition.